Designing your own cross stitch pattern requires you to use cross stitch graph paper. This type of paper has small square grids on it. The graph paper helps you to make a beautiful cross stitch patterns of your own design. The graph makes it possible to keep the design in perfect scale to the original artwork. When you design a cross stitch pattern, you, or a computer program, will put a colored x in each square that indicates what color to stitch. Use the following graph paper pages to design your own cross stitch pattern. One paper has solid lines for more concrete, simple designs, and one has dotted lines for the more experienced cross stitcher who is incorporating additional embroidery stitches into her design. To print, click on the image and click the download or print icon. If you need help, see this guide. Once you have graph paper, you can convert your favorite piece of art or family photo into a cross stitch pattern. Old photos and prints, clip art, a poem, or your favorite drawing are converted into a cross stitch design on the graph paper. Start with a simple design, such as a handprint, with only a few colors for your first homemade cross stitch pattern. To make a handprint design, have a child place their hand on the graph paper and trace around the perimeter. When you sew the cross stitch you will put a stitch in each of the squares that contains a line. Use brightly-colored thread, and consider capturing your child's handprint at various stages in his or her development. This craft makes an excellent nursery wall decoration or gift for grandparents. Make a cross stitch of a family photo by transferring a photo onto cross stitch graph paper. Upload your photo into the computer. To do this you need to use a scanner. Crop the photo to the size you want. The best photos do not have a lot of peripherals around the focal point. In other words, if the photo is of a person, there should be little to no furniture or objects in the background. You can remove the background of photos using your scanner or Photoshop program. Transfer the photo into the program with the graph paper and adjust the size of the photo if necessary. The photo and colors will all be on the graph paper. Print your image. When you do the cross stitch, just follow the graph paper design. There are several Internet sites that offer free graph paper to print out. You can print the graph paper out plain or upload a photo into their program and make your charted design. CyberStitchers.com has free printable graph paper. You can change the size of the grid to suit your needs. The underlay feature allows you to put your own photo or picture behind the grid before you print it out. You can also reduce or enlarge the size of the photo as needed. 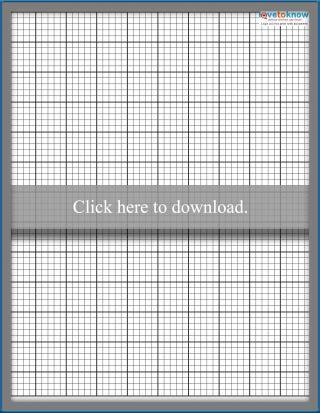 Needlepointers.com has free graph paper and also free cross stitch patterns. JPFun.com has free printable graph paper. Upload your favorite photo or image and print it on the graph paper. Laydenwithstitches.com is a free tutorial cross stitch site. 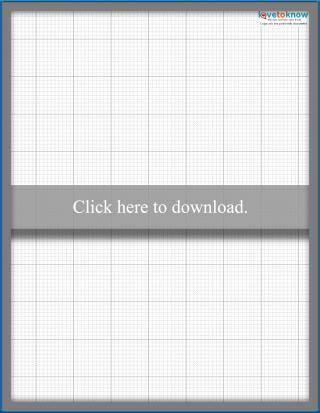 It also offers free software to down load your graph paper design. After you have more experience as a cross stitcher, you can be more creative when making your own cross stitch graph paper. Cross stitch projects can range from very easy and quick to more complex. The more experience you get, the easier it will be.